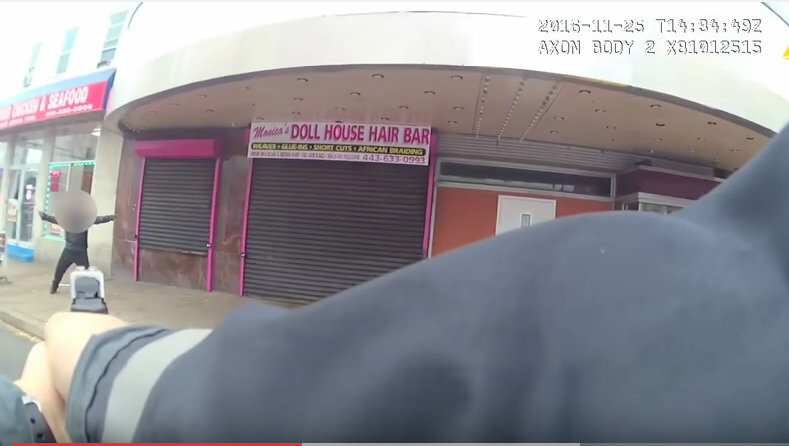 Newly released police body camera footage seems to confirm what police have said and bystanders described – the man holding knives and scaring people on Greenmount Avenue on November 25 was in the midst of a mental health crisis. “He was standing on the corner with a blank stare on his face, pounding a pole or cane on the cement and incoherently babbling,” said Derek Baumgardner, who happened to be driving by on the day when two police officers, responding to a 911 call, shot the man. The agency’s unconstitutional use of excessive force against people with disabilities. The body-cam video shows the man, dancing and yelling, ignore multiple commands to drop the knives. But he does not lunge at five police officers and keeps a distance on the empty street, his arms outstretched. About a minute after the officer approaches the man, another officer fires a Taser at him. “The appropriate response would have involved mental health workers skilled at engaging individuals in behavioral health crisis and de-escalating this type of encounter,” she said. “Resorting to gun violence, causing serious injury and trauma or even death under such circumstances is deplorable,” she said, adding that she has forwarded the video to Justice Department officials. Critics acknowledge that the public has good reason to resist second-guessing police officers, who are called upon to protect citizens in dangerous, potentially life-threatening situations. But along with calling for better training of officers, they are pressing for the creation of a crisis response network so that police officers don’t have to be the first responders in such situations. “We urge Baltimore City to invest in a comprehensive crisis response infrastructure to reduce police interaction with disabled people, avoid costly, needless incarceration and hospitalization and save money and lives,” said Marcus. Meredith Curtis, communications director for the American Civil Liberties Union of Maryland, agreed. Curtis pointed to agencies in other cities, such as Camden, N.J. or Portland, Oregon that have adopted such a model with some success. The crisis training teaches officers about psychiatric medications, allows them to role-play various scenarios, and gives them opportunities to interact with people who have a mental illness when they are not in crisis. They are taught to “use distance and time” to try to defuse potentially violent encounters. The critics say there is ample data to back up their contention that the criminalization of disability, often mixed with race discrimination, is at the root of interactions that go needlessly wrong. Reviewing 2010- 2014 data the ACLU found that 38% of the 109 people who died in police encounters in Maryland presented in a way that suggested a possible medical or mental health issue, disability, substance use or similar issue. Looking at 2015 data, the ACLU found that nearly half of the 21 people who died in police encounters in Maryland presented in a way that suggested a disability or various crisis issues. About 90% of the encounters involved African-Americans. Instead of calling for back-up, a single officer responded, went to the door and encountered Zachary standing in the doorway with a lit cigarette in one hand and a knife in the other. “The officer reportedly ordered the man three times to drop the knife and, when he did not comply, the officer fired, killing him,” the DOJ report said. 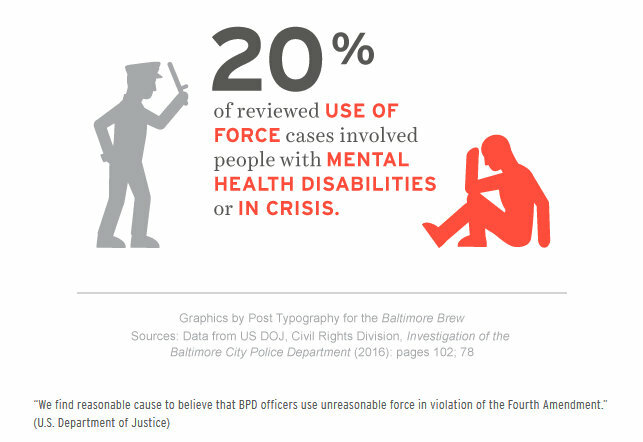 Roughly 20% of the use-of-force incidents the Department of Justice investigators reviewed involved people with mental health disabilities or people in crisis. The investigators determined that BPD’s routine use of unreasonable force constituted 4th Amendment violations and illegal discrimination under the Americans with Disabilities Act. The idea that police need better strategies and support for dealing with people in crisis is hardly new, either in Baltimore or elsewhere. As the founder and executive director of the Baltimore Crisis Response, Edgar Wiggins has been involved with the issue for more than two decades. His non-profit offers a wide range of counseling services, a 24-hour crisis hotline that responds to 40,000 calls a year and assorted residential services. The organization also has a mobile crisis team that, operating from 7 a.m. to midnight, averages 2,500 responses a year. One thing BCR does not have is “unlimited resources,” Wiggins told The Brew in an interview conducted this summer following the fatal shooting by Baltimore County Police of Korryn Gaines. Since 2004, Wiggins said, he and others have provided training for Baltimore police on how to deal with people in crisis. Wiggins said the training was provided to experienced officers who had been on the street. Wiggins said he respects officers’ concern about their own safety in interactions with troubled individuals. “I will never knowingly send somebody out if I know there are firearms involved,” he said. Wiggins said he is hopeful that city police will invest in more training and the use of non-police professionals with the skills and time to get people the help they need. Marcus said her group considers the establishment of a coordinated crisis response network in Baltimore “extremely urgent” and a high priority. Meanwhile Baumgardner, the eyewitness who saw the man on Greenmount Avenue before the police shot him, said he knows city police have a tough challenge and doesn’t blame them. “The officers who fired at the man did what they were trained to do,” he said.